Congress recently enacted and the President signed into law the most sweeping reform of food safety regulation in many decades. Known as the FDA Food Safety Modernization Act (FSMA), the new law includes several new items for FDA's enforcement toolbox that have long been sought by consumer advocates. David Joy is an attorney in the Washington office of Venable LLP, specializing in food and drug regulatory matters. He also is a former monthly contributor to Food Processing. He is a member of the District of Columbia Bar and holds a bachelor's degree in chemistry. Following are seven things you should know about the new provisions and their impact on food processors. FDA now has legal authority to order the recall of dangerous foods. Up until now, FDA has had authority to order the recall of infant formula, but could only ask, not demand, that other foods be recalled. Under its new authority, the agency can order a responsible party to recall a food product if there is a reasonable probability the food is adulterated or misbranded and its use "will cause serious adverse health consequences or death to humans or animals." This quoted language matches the criteria for a Class I recall, the most serious type, as long defined in FDA's regulations. Under the new provisions, FDA must first provide the responsible person with an opportunity to cease distribution and recall the product voluntarily. If the responsible person fails to do so on FDA's timeline, FDA may issue an order requiring an immediate recall. The responsible person may dispute FDA's recall order at an informal hearing. Civil penalties and fees may be assessed against any person who does not comply with a recall order. It is difficult to imagine a food manufacturer — under normal circumstances — declining the opportunity to conduct a "voluntary" recall and instead waiting for issuance of a mandatory recall order. It is further difficult to imagine a food manufacturer prevailing at a hearing to dispute a recall order, unless FDA is operating under a very significant factual error. In practice, food manufacturers facing this situation will want to be seen as cooperating with FDA and will be concerned primarily with retaining consumer confidence in their products. For these reasons, it is likely FDA will not actually issue many recall orders. The existence of this authority, however, changes the landscape. It is now more important than ever for food manufacturers to have standard procedures in place so recalls can be initiated promptly and effectively. FDA's new mandatory recall authority became effective immediately when President Obama signed the FSMA into law on Jan. 4. The new law states that FDA shall increase the frequency of inspections at all food processing facilities. More specifically, domestic facilities identified as high-risk are to be inspected at least once in the five-year period following the date of enactment and at least once every three years thereafter. All other domestic food processing facilities are to be inspected at least once in the seven-year period following enactment and at least once every five years thereafter. FDA is further instructed to increase inspection of food at ports of entry, which can be expected to lead to more shipments of food and food ingredients detained upon import. To meet these goals, FDA may rely on inspections carried out by other federal, state or local officials. Since the Bioterrorism Act of 2002, food processors have been required to register their facilities with FDA. Under the new provisions, these registrations will need to be renewed every two years. Registrations also will need to include an assurance that FDA will be permitted to inspect the facilities. Most significantly, FDA now will be able to suspend the registration of a facility if it determines that food manufactured at the facility has a "reasonable probability of causing serious adverse health consequences or death to humans or animals." If a facility's registration is suspended, food from the facility cannot be introduced into interstate commerce in the U.S. This is similar to USDA's longstanding authority to withdraw inspection from a meat processing facility, effectively shutting it down. The agency is required to adopt regulations to implement these provisions. Facilities will be subject to these requirements either on the date when FDA issues its implementing regulations or 180 days after enactment of the new legislation (i.e., this July) whichever comes sooner. It is likely July will come sooner than FDA's issuance of the regulations. The impact of this authority on food processors is potentially significant, as it places a very powerful enforcement tool in the agency's hands. Even the implied threat of a registration suspension will likely draw concessions from an affected food processor. 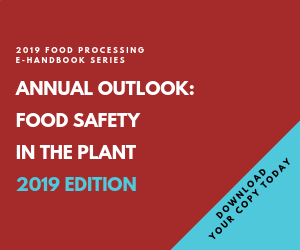 The new law requires every food processor to evaluate known or reasonably foreseeable hazards that may be associated with a facility, develop a written analysis of the hazards and identify and implement preventive controls. This is similar to the hazard analysis and critical control points (HACCP) programs that are currently mandatory for juice and seafood, but allows for the possibility that some operations will not include critical control points. Food processing facilities will be required to monitor the effectiveness of their preventive controls, verify their adequacy, and undertake a periodic re-analysis of their plans. Facilities also will be required to maintain records for not less than two years documenting their monitoring of preventive controls and instances when corrective actions were implemented. Importantly, the law gives FDA authority to demand access to a written plan that describes the procedures put in place as well as the required recordkeeping during an inspection or at any other time. For the past several years, FDA has issued a significant number of warning letters to seafood processors following inspections, citing their failure to have and implement a written HACCP plan. One predictable consequence of the new law is the extension of this type of warning letter to all other food processors. In egregious cases, or after repeated warnings, FDA may seek to suspend a facility's registration. Not later than 18 months after the effective date of FSMA (i.e., not later than July 2012), FDA is required to adopt regulations to establish standards for hazard analysis and preventive controls. FSMA's provisions regarding hazard analysis and preventive controls go into effect at this same time. The new legislation directs FDA, in coordination with USDA, to determine the most significant foodborne contaminants at least every two years. Based on this review, and when appropriate to reduce the risk of serious illness or death to humans or animals, FDA is to issue contaminant-specific, science-based guidance documents or regulations aimed at controlling these contaminants, which may include action levels. This may result in mandatory preventive controls and new limits for microorganisms, heavy metals, and other contaminants. The new law does not establish new traceability requirements for food ingredients, but it takes a big step in this direction. It directs FDA to establish pilot projects in coordination with the food industry to explore methods to rapidly identify recipients of food that may be contaminated. Watch for new traceability requirements to follow. The price tag for FDA's implementation of these provisions has been estimated by the Congressional Budget Office at $1.4 billion over the next five years. This includes FDA's hiring of 2,000 new inspectors. Earlier versions of the law would have had a significant portion of this expense borne by the food industry in the form of new user fees. As enacted, however, the law allows FDA to collect only modest fees. Fees may be collected from facilities subject to reinspection and from responsible parties who fail to comply with recall orders, for example. FDA's ability to fully implement the law will obviously depend on adequate Congressional appropriations. This overview is aimed at highlighting several features of the new law of interest to food processors. It is not a comprehensive overview. Food processing facilities should promptly review their operations with a complete checklist of compliance issues raised by the new law. Food processors should also pay attention to developments in the area of FDA funding. Some features of the new law, notably the requirement of more frequent inspections, obviously cannot be carried out without new resources. Others, such as FDA's mandatory food recall authority, are not dependent on new appropriations. Finally, the law is noteworthy for at least one item it does not include. Consumer advocates and some in Congress have long called for the creation of a single food agency, one that would combine the food regulatory functions of FDA, USDA and others under one large roof. This idea has been rejected and hopefully put to bed as a costly and unnecessary reshuffling, not likely to have a real impact on food safety. ...but who will pay the $1.4 billion?